Introduce your toddler to farm animals with new DK Pull the Tab Series! Packed with fun for toddlers Pull the Tab Farm is perfect for early learning so your toddler will get to know all the different farm animals. From ducks and lambs to ponies and pigs, all the pages have bright colourful pictures of farm animals to entertain and engage toddlers. This new early learning book from DK is part of a new series perfect for introducing all types of farm animals to toddlers. The easily recognisable images and labels will encourage recognition and naming while the pop outs promote sensory learning. 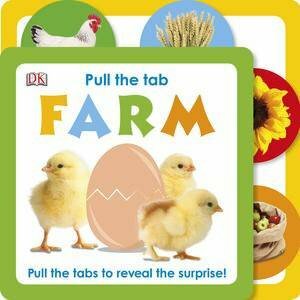 The lively, rhyming text for each farm animal is perfect for parents to read aloud making Pull the Tab Farm even more interactive and fun for toddlers. Perfect early learning for toddlers who can pull the tabs to reveal farm animals!